Last weekend was a weekend of robbery. It began on Saturday with an unjust and unexpected playoff loss for the Denver Broncos. And even though I’m not a diehard sports fan, playoff losses are like getting pinched in the armpit: totally unexpected and shockingly painful. Then on Sunday afternoon, Mike and I returned home to discover that his road bike had been stolen from our complex’s underground parking garage. The unbreakable lock that was attached was not, in fact, unbreakable. We discovered the broken lock remnants and Mike got really quiet for a few hours. Meanwhile, I got really angry-chatty, the kind where I start sentences with “What kind of person would…” and “How is it possible that…” Lucky for you, I fleshed out most of my feelings of outrage in my journal. Mike said I was being ridiculous, that I probably just left the journal somewhere around the house. I told him to notify our insurance about my stolen diamond thoughts. After that, the TV volume abruptly increased, which I assumed was totally incidental. Sometimes the TV volume overpowers Mike’s empathetic response. Mike says this means we need a newer, larger TV. I told him to stop changing the subject. I think about those signs without ever posting them, which means the criminal has no idea about the forthcoming justice. He has no idea that he needs to protect his armpits. Really, there is nothing to be done. You slap your forehead, pace a few circles, and then shake it off. I guess recovery comes in sentences that start with, “It’s only a bike…” “It’s only a football team.” and “We’ll get em’ next season,” even if we don’t know for sure. Robbery recovery occurs when we release things we weren’t ready to and practice accidental benevolence on days we aren’t feeling particularly generous. It’s a catalyst for grace when I would rather morph into a vigilante, the kind with an aerodynamic unitard and satisfying chase scene. Ha! I loved this! Love your writing style, Bekah! Thanks so much for reading, Bri! Too funny! This made me laugh and I agree, I really like your writing style. Very witty. Dearest Bekah, I loved this. That loss felt like someone ripped my heart out then blended it(dramatic I know). Thanks for the laugh and don’t you worry next time I’m in Little Italy I will be on the lookout. Tennae. Thanks for joining the cause! Hope to see you soon! This is great and comical at the same time. This has Shock and Awe potential! While I certainly can entertain your more contemplative response “you’re welcome” to the thieves, I happen to have the more visceral feelings of “**** ***!!! !” towards those low life scum bags. I’ve said it once and I’ll say it again, but there is a special place in hell for terrorists (foreign and domestic), child molesters, and bike thieves. Such juxtaposition has me happy that not everyone feels angry when bad things happen. Keep up the good work you happy one you. Well, I’m pretty sure you are not my mother, but I can certainly appreciate your more visceral feelings towards thieves. Thanks for commenting! 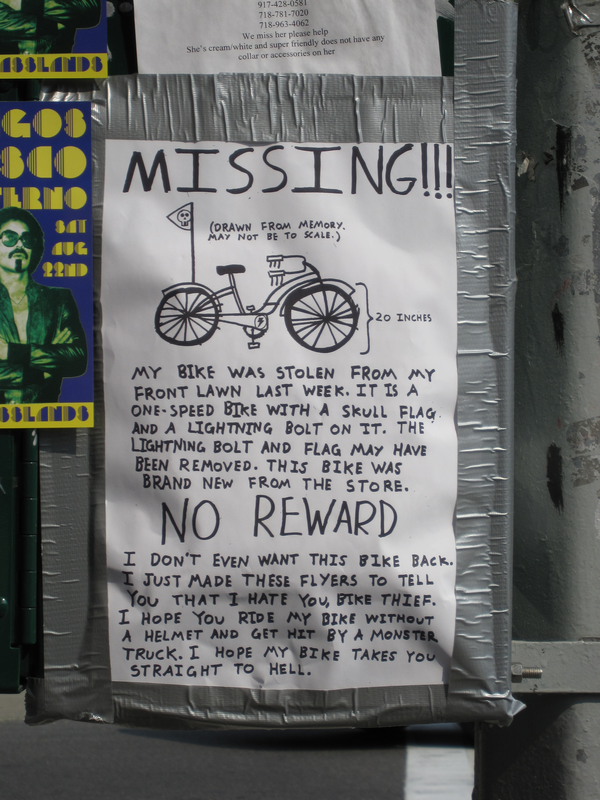 i plan on posting these flyers around our building — I doubt I will get my bike back, but I think it will make me feel slightly better about the whole situation..